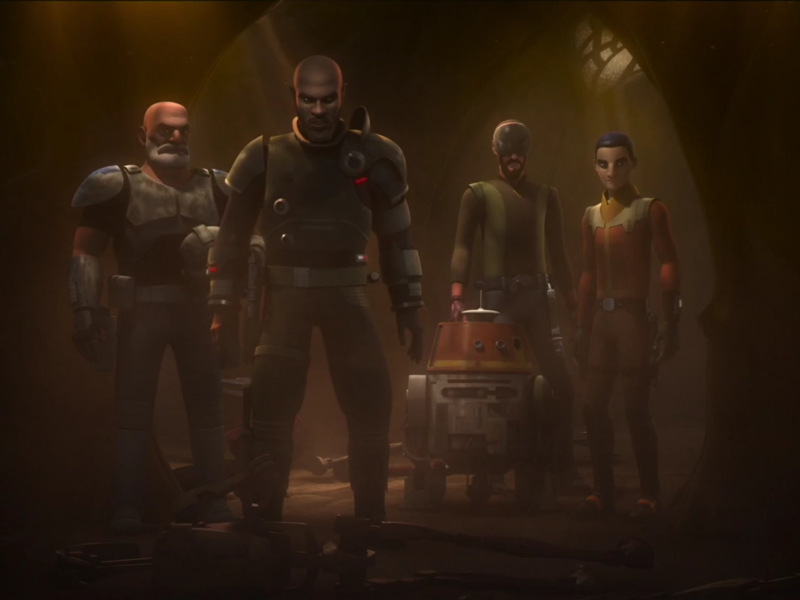 The crew of the Ghost is sent on a mission to find the rebel team which which vanished while investigating the disappearance of the Geonosians. That team’s leader is Saw Gerrera, and his last transmission reported a power source. Can the Ghost crew save Saw’s team and solve the mystery of what the Empire had been doing there before wiping out the population of Geonosis? Is Saw somebody they can really work with? This episode does a great job of aiding the work, which began in Rogue One, of connecting the Prequels to the Original Trilogy. One bridge to the past is Rex. Upon arriving on Geonosis, he comments that he had hoped he would never have to return to this dustbowl. It reminds us that not only was Rex prominent in The Clone Wars, but was also there in Attack of the Clones when the first set of clones saved some of the Jedi from Count Dooku and the Geonosians. Rex also states, although Kanan can do incredible things, he's no Skywalker. Rex has witnessed the most formative events of the Empire and doesn't realize the man he admired is now causing some of the greatest atrocities ever committed. Rex also recounts how he knows Saw. Those events took place in The Clone Wars. With this, we are able to see what shaped Saw and led him to become the man we see in Rogue One. Sabine and Zeb find a working shield generator still in working order. It looks just like the one used on Hoth in The Empire Strikes Back, and this episode probably answers the question of how the rebels got their hands on the power core for the Hoth shield generator. Zeb wonders what the Geonosis shield generator was protecting. That question seems to be answered when a lone surviving Geonosian draws in the dirt a circle within a circle. The thought of a Death Star being built there brings to mind Rogue One, A New Hope, and Return of the Jedi. The picture comes into sharper focus. At the end of the Clone Wars, the newly formed Galactic Empire inherited a galaxy in disarray. To control a population accustomed to fighting for independence, the Empire is forced to develop the ultimate weapon. This galaxy in turmoil is what we see in Rogue One and A New Hope. In Rogue One, we see a Galactic Senate which still holds some sort of power. In the movie, dissatisfied members of the Senate seem to think that, with evidence of the Emperor’s nefarious plans, they can vote the Emperor out of power. The members of the Ghost crew have a similar notion about evidence they find on Geonosis. The appearance of Bale Organa in this episode is a nice touch in that regard. There is evidence that the Empire does have some fear of the attitude of the Senate. They do want to keep the Death Star a secret until it is fully operational. In Rogue One, Darth Vader is upset with Director Krennic for destroying Jedha City. Vader must make up an excuse about the city’s destruction to keep the Senate from getting suspicious. Only in A New Hope do we see the the Empire ready to expose their true colors for the entire galaxy to see. The Emperor disbands the Senate and gives control to the local governors. It appears that the Emperor was not sure of the Empire’s ability to control the galaxy with its fleet alone. For about twenty years, the Emperor hid his real desires from all but a few until the Death Star was complete. This episode of Rebels awakens the frustration of lost opportunities. The crew of the Ghost is so close to getting evidence of the existence of the Death Star. There is actually a plan agreed to in this episode which would have surely led to the Death Star’s discovery. Circumstances lead to the abandonment of that plan, but you can’t help but wonder what finding out about the Death Star before it was fully operational could have meant to the Rebellion. The exasperation continues every time the rebels think about the drawing of the circle in a circle. On multiple occasions, they see items and surmise that is what was represented by the drawing. These conclusions keep them from investigating the drawing any further. We know they are wrong and yell at the screen, “It’s the Death Star! Follow up on this clue!” Alas, it is to no avail. With all this information about the bigger picture in Star Wars, the reintroduction of Saw Gerrera fits perfectly. We are told in this episode he is extreme, and by the time of Rogue One, the Rebellion has distanced itself from him because he is causing them problems. His differences from the Ghost crew are highlighted in a disagreement between the two. Saw wants to treat a prisoner with no sympathy, and wants to question him even if it means the extinction of his species. Hera and the others put the survival of the species before the desires of the Rebellion. This is the crux of the episode, and is deep thinking for children as young as seven. From my worldview, Ezra’s idea of protecting the people of an entire race outweighs gains in warfare, even though more rebels will die from that course of action. Other schools of thought will tell you Saw was right because the needs of the many outweigh the needs of the few. There is also the question of working with Saw at all because of his extreme ideas. Saw must help our heroes in the end of the episode, even though they disagree. Knowing he is against the Empire must be enough for now. There are still mysteries about Saw. We know about the loss of his sister and how that has affected him. However, Saw appears younger here than in Rogue One, he doesn’t appear to have the robotic legs he had in the movie and he isn’t inhaling gas from a mask on his suit. There seems to be many big events yet to unfold in his life. The most exciting part of the episode was when Rocket Troopers, Stormtroopers with jet-packs, were sent to attack the Ghost in tight quarters. They just looked cool! It was a short sequence but provided needed humor after wrestling with a moral dilemma. We are provided with one of the visuals that I love the most in this show, the crew on the outside of the ship while it is flying. It always adds excitement and a real sense of danger. It may just be the afterglow of Rogue One, but there is nothing really wrong with this episode. It is exciting to see so many major things meet up in this one episode. As good as the movie is, I anticipate appreciating it more as Rebels fills in more details. Entertaining, thought provoking and a blending together of the many different parts of the overarching story.